Who is jealous of whom in Isaiah 11:13? When reading this verse in the past it I seemed to take it for granted that Ephraim was jealous of someone else, likely Judah, rather than being the target of other's jealousy. There is clearly an AB/AB parallelism structure in Jealousy/Harassing/Jealousy/Harassing. But there is also a pattern of Ephraim/Judah/Ephraim to Judah/Judah to Ephraim. Once I saw this made me question the first line. Is Ephraim being envied, rather than being envious? Because in the 3rd line Ephraim clearly is being envious, so why is the 1st line saying that? The 2nd and 4th lines invert who is being harassed, so why wouldn't the 1st and 3rd invert who is being jealous, or who is being envied? But I don't know Hebrew well enough and no commentaries I can find dive very deep into thus verse. Is Ephraim being jealous, or are they the target of other's jealousy in the first phrase of Isaiah 11:13? Said differently, Is "jealousy of Ephraim" denoting Ephraim's possession of jealousy or someone else being jealous OF Ephraim? And he shall turn aside the jealousy of Ephraim, and those of Judah who cause trouble will be cut off. Ephraim will not be jealous of Judah, and Judah will not trouble Ephraim. Who is jealous of whom here, is not a problem -- Ephraim is Jealous of Judah. The real issue is the expression וְצֹרְרֵ֥י יְהוּדָ֖ה (and the troublers of Judah), which is not a reference to those who cause trouble FOR Judah, but those OF Judah who are the source of concern for Ephraim. When these ones disappear from Judah, then Judah will no longer trouble Ephraim. Not the answer you're looking for? 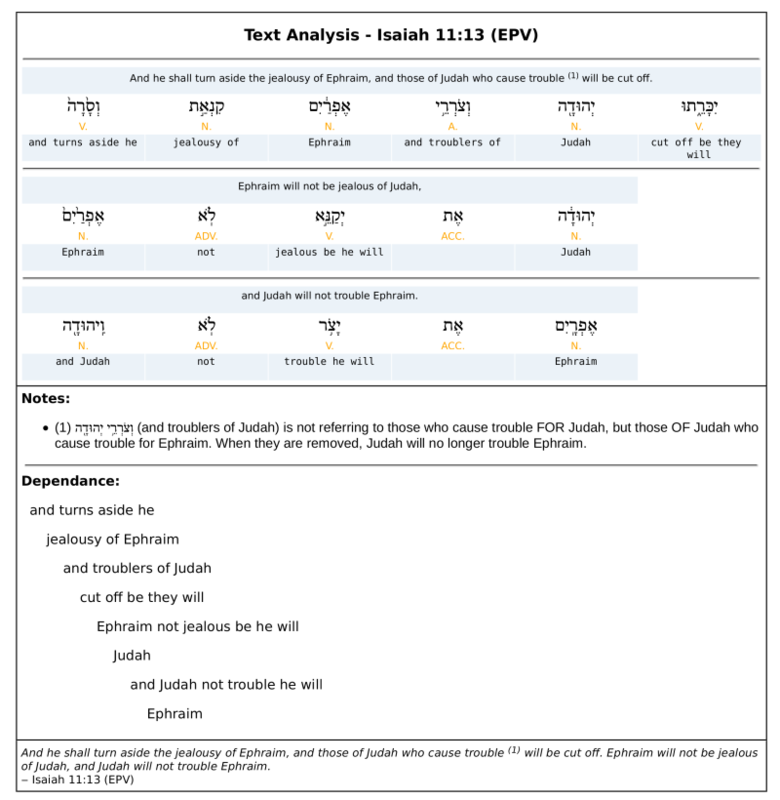 Browse other questions tagged hebrew isaiah referent-identification or ask your own question. What is the meaning of “Jealous” in Exodus 20:5? Isaiah 7:15: to whom does this verse refer?